Pulled pork in a Hickory flavoured BBQ sauce wrapped in puff pastry. 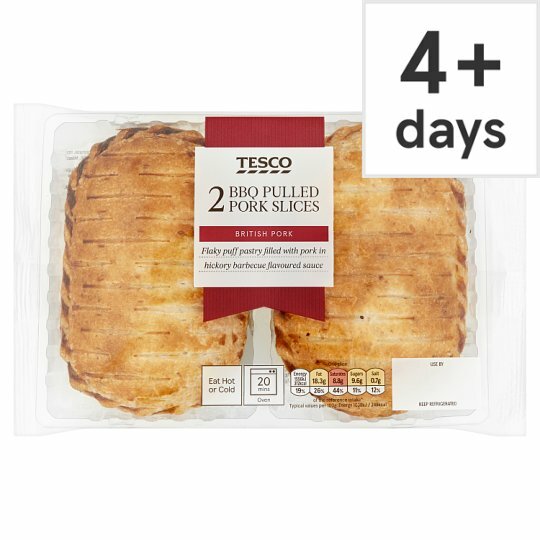 British Pork Flaky puff pastry filled with pork in hickory barbecue flavoured sauce. Our expert bakers make the pastry for our slices, creating layers of flaky puff pastry. The fillings are cooked for tenderness and packed into the pastry, so you get flavour in every bite. The slice is then baked with a milk glaze for a crisp, golden finish. Wheat Flour (Wheat Flour, Calcium Carbonate, Iron, Niacin, Thiamin), Water, Pork (16%), Palm Oil, Mixed Peppers (Red Pepper, Yellow Pepper), Onion, Wholemeal Wheat Flour, Cornflour, Fructose, Sugar, Rapeseed Oil, Hickory Smoked Water, White Wine Vinegar, Tomato Paste, Glucose Syrup, Molasses, Tomato Purée, Salt, Coriander, Dried Skimmed Milk, Onion Powder, Smoked Paprika, Acidity Regulator (Malic Acid, Acetic Acid), Black Pepper, Allspice.